There is a world of social media tools available today. Some, are created for enterprise businesses and others for small businesses. Some are multi-purpose and others have a singular purpose, designed for specific platforms. With so much choice (and functionality) it’s hard to know where to start, and which tools are right for your business. But, don’t worry, in this post, we break down 12 of the most popular social media platforms and highlight the businesses and purposes they are best suited for. So, if you’re ready let’s get started. The first tool on our list is our own Tailor Social. 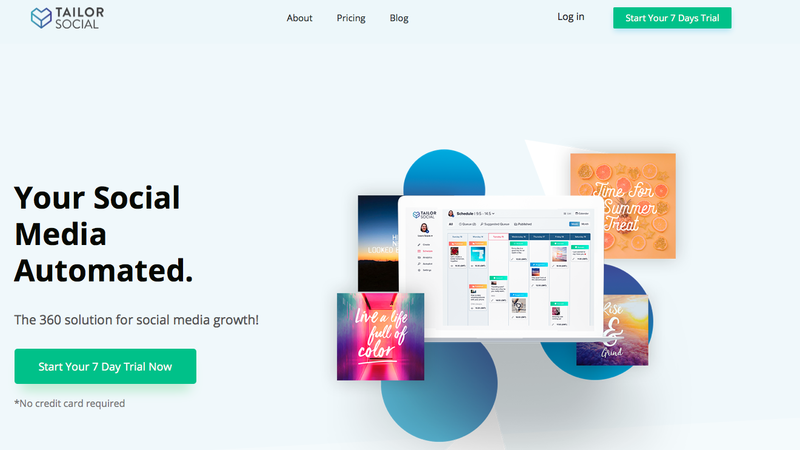 And although the new kid on the block, Tailor Social is packed with experience and provides everything you need to manage and grow your business on social media. Tailor Social is the complete social media marketing tool. Ideal for solopreneurs and small to medium-sized businesses. You can schedule your posts and have them automatically posted to the major social platforms. You can also design beautiful social posts for more engaging images. In addition to scheduling and designing posts, Tailor Social has a powerful content discovery engine that finds content related to your audience and industry; you can then quickly add this content to your schedule. Tailor social also takes the guesswork out of your social strategy by providing actionable analytics that let you know what content your audience is engaging with, allowing you to do more of what works. To take Tailor Social for a test drive, you can sign-up for a no strings 7-day trial. Agora Pulse is a comprehensive social media management platform which allows you to enjoy full reporting, scheduling, and response functionality. Among its many benefits are affordable Facebook contest apps, and effective competitor analysis. Agora Pulse is available with a 15-day free trial, and pricing begins at $49 and runs $299 per month on the top end. This social media management tool is used by 11,000+ customers, particularly SMEs. Agora Pulse is ideal for agencies and teams, and it fully supports multiple networks including YouTube, G +, LinkedIn, Instagram, Twitter, and Facebook. The top features include publishing, engaging, listening, reporting, and collaborating with customers. As a one-stop solution for all social media management functions, Agora Pulse has stellar metrics to track the power of your social media content. Everypost is an effective solution for social media publishing. This content duration wunderkind allows you to generate content from 1 place. You can pull audio-visual content from multiple sources including RSS feeds, YouTube, Flickr, Instagram, and others, and instantly publish on multiple platforms. Everypost allows for instant customization based on your audience. This allows for unique content to be created before cross-posting begins. As with other powerful social media more management tools, you can collaborate with your team wherever they are in the world, schedule posts, publish posts, and streamline the workflow. Everypost pricing is available in monthly or yearly installments, and it’s ideal for nonprofits and educational institutions too. The personal plan is free, and it connects you to 1 channel, and there are other plans ranging in price from $9.99 per month upwards of $99.99 per month where you can enjoy 120 connected channels with 12 group management options, and up to 25 team members collaborating. Among others, users get to enjoy social analytics, unlimited content duration, and more. This service is ideal for personal and business purposes. Hootsuite has been around for many years, and it has established itself as one of the front-runners in social media management. It’s ideal if you’re looking to schedule posts across multiple social media channels and have them automatically post at pre-set times and dates. 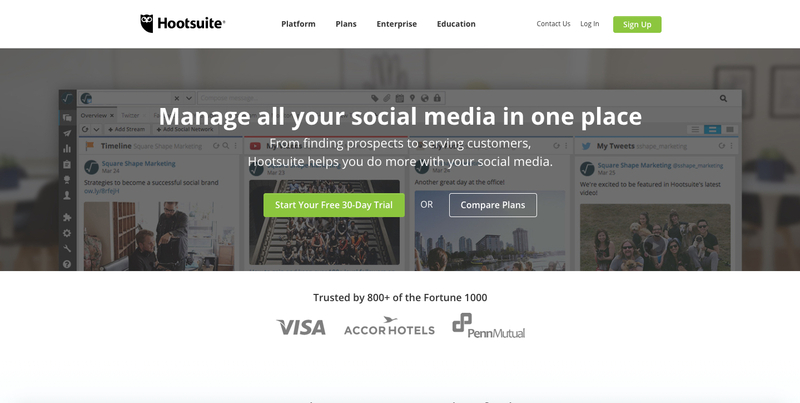 Hootsuite is one of the most useful ways of creating a well-oiled social media machine across multiple channels with full collaborative features, team management, permissions, scheduling, reporting and the like. There are many benefits to using this social media management function, including scheduling up to 30 posts, 3 social profiles in one place, and the ability to generate lots of leads with a variety of social contexts. You can schedule hundreds of social media post simultaneously, irrespective of where they’re going to be posted. By managing your social content this way, you don’t need to log in and out of different social media channels to post. Everything is managed from one place and you can even track and prove the social return on investment (ROI). Social media professionals and ad agencies looking for a powerful scheduling tool and social media marketing tool will love Social Pilot. Users report favorably about the analytics and scheduling elements in Social Pilot, and thanks to an effective client management feature, it is a useful tool for marketing agencies with scores of clients. The value in this social media management tool is its ability to provide suggested content that is relevant to your market. The content calendar in this social media tool allows for scheduling and editing with drag-and-drop functionality. 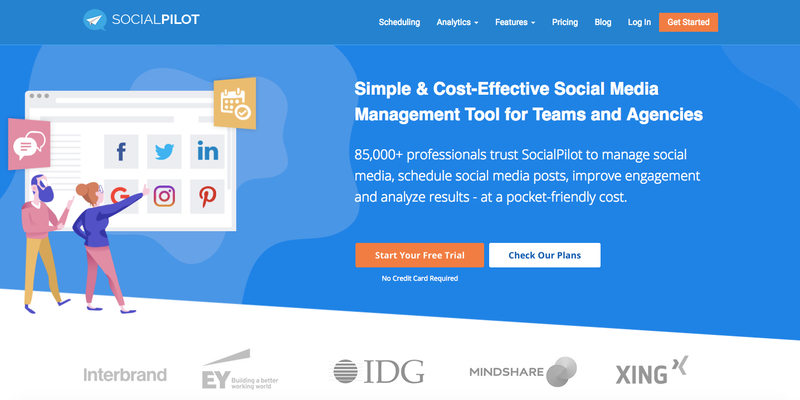 Social Pilot is best suited to add agencies and large teams, and this resource is already used by 85,000+ social media marketing professionals around the world. Among its best features are its white label PDF reports, powerful analytics, collaborative elements, client management features, curated content, and more. Individual plans run approximately $8.33 per month, professional plans $20 per month, and team options start at $33.33 per month, rising to $66.66 per month for agencies. Friends+Me is a great social media management tool for scheduling your content. Since you don’t have to publish posts immediately, you can choose when will be the best time to have them published. When you post at the right time, you can engage your customers far more effectively. Friends+Me is ideal for Pinterest, Twitter, G +, LinkedIn, Facebook, and tumbler. By collecting content and creating content, businesses can increase their reach with their customers in a well-organized way. Friends+Me has many SEO benefits, making it the preferred solution for increasing your brand’s online visibility. Other features include cross-promotion workflow on multiple social media networks. As far as pricing goes, it is free for individuals, and you can schedule 5 posts per individual account with an additional team member available. The individual plan runs $7.50 per month, while small businesses can expect to pay $24.17 per month, medium-sized businesses $49.17 per month, and large businesses $215.84 per month. 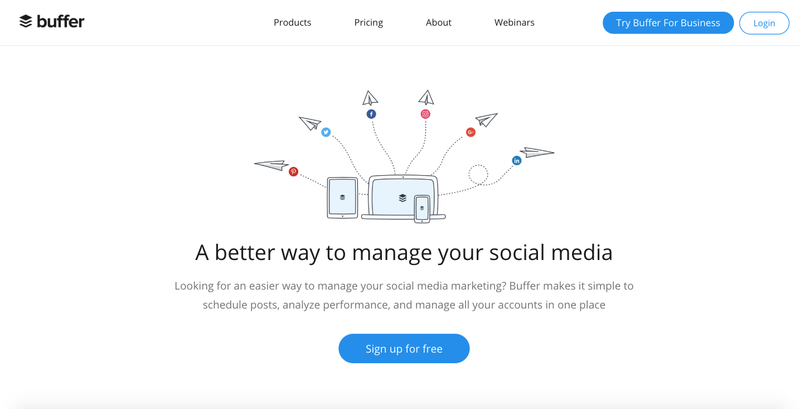 Another powerful social media management system is buffer. It allows you to manage all of your social media accounts on one dashboard. You can schedule your posts on G +, Pinterest, LinkedIn, Twitter, Instagram, or Facebook, among others. The management functionality of this system is awesome. You can install browser extensions, for Android or iOS, and the analytics allow you to track customer interaction and engagement with your posts. Plus, you can also see daily impressions on posts and collaborate with teammates at your leisure. To date, some 8,000+ business customers now use buffer for their social media management initiatives. Buffer allows for automatic posting according to your chosen schedule, with single images. It also allows you to set reminders about image posts and videos. Full mobile functionality on Android and iOS makes it easy for you to instantly share posts to social media, while you’re on the go. There are free plans and professional plans available. The individual plan is free and allows you to manage 3 social accounts with up to 10 scheduled posts per profile. The professional plan is affordable at just $15 per month and allows you to enjoy 8 social accounts with up to 100 scheduled posts per profile. Businesses can also enjoy the benefits of buffer, with 150+ social accounts, and 25+ team members with the enterprise solution. Sprout Social utilizes data to help you make better decisions. It presents your social media marketing strategy in such a way that you can quantify and validate the results, with content and engagement habits in the analytics. You can plan, organize and control your social media content, and direct the narrative exactly as your company desires. Sprout Social is ideal for strengthening customer relationships, since it entices engagement around your brand on social media channels. This social media management resource is ideal for small businesses, agencies, and enterprise-level organizations. The platform is fully integrated with G +, LinkedIn, Instagram, Twitter, and Facebook, with complete analytics and social CRM functionality. 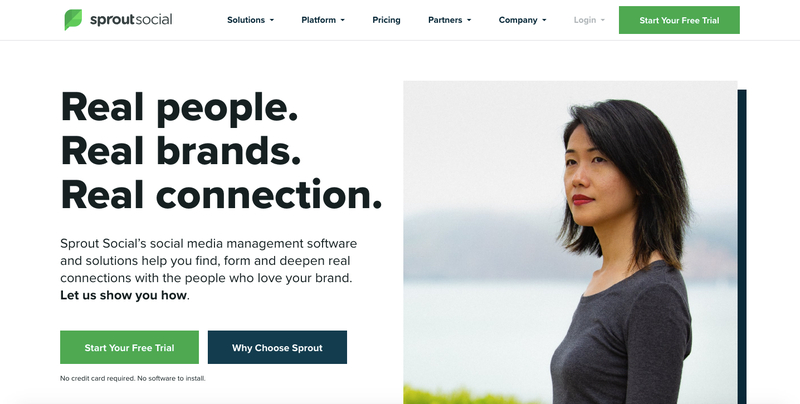 Sprout Social is available in a free trial version, or $99 per month for premium accounts, and $149 per month for corporate accounts. The enterprise-level package runs $249 per month. 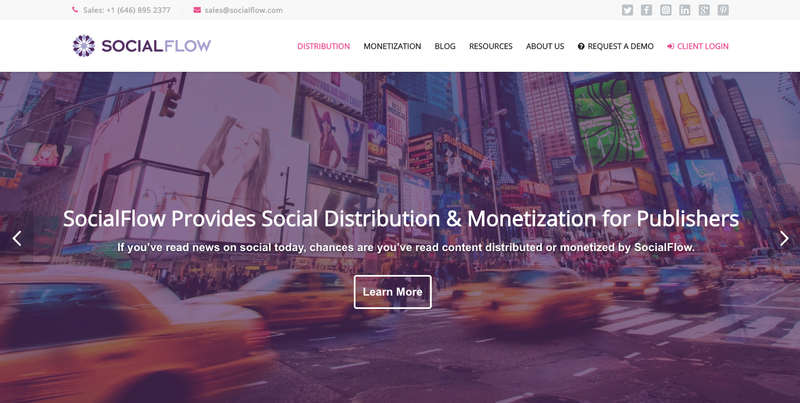 SocialFlow helps you to grow audiences, readership, and gain SEO authority on the Internet. 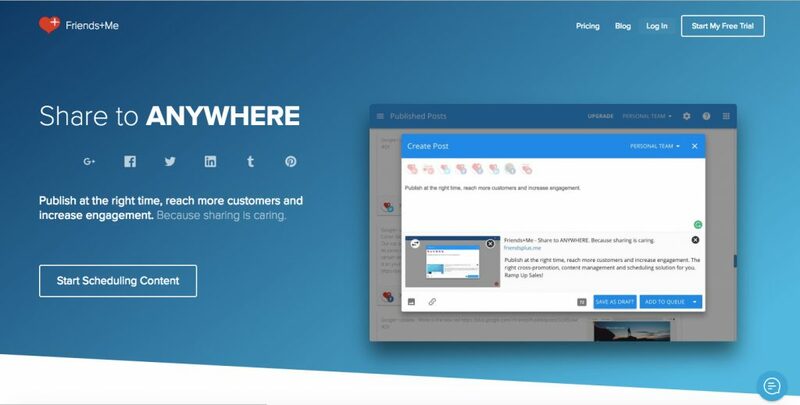 This social media management tool empowers employees and team members by automating activities and allowing for mass publishing across social media. It also serves as a good way to unlock incremental value from readers, and its optimization tools are second to none. SocialFlow offers many benefits to clients, including full analysis of responses with continuous loop feedback, quick identification of top-performing posts, the development of novel advertising opportunities, and the publication of posts at optimal times. SocialFlow is best suited to large-scale publishing companies, where social media scaling of posts is required. According to the company’s analytics, an estimated 600 million+ unique social users now enjoy SocialFlow. The name says it all – Social Oomph. This powerful social media management resource is a great way to re-post content, or social media posts on Twitter and Facebook. Whether you are a one-man show, or a small business with multiple employees, Social Oomph can certainly offer time-saving benefits to manage a rather limited social media strategy. This service is available in a free format, and a professional format, and there are multiple social media channels supported, including Twitter, email, RSS feeds, LinkedIn, Pinterest, and Facebook. The professional version costs $17.97, and the Twitter Unlimited Version is $6.97. As far as affordable options go, this one certainly ranks right up there with the best of them. It is rather rudimentary on many levels, but effective at mass posting. It’s easy to increase the size of your social media fan base by engaging them with relevant content. Luckily, Quuu is one such social media management tool that can do that for you. 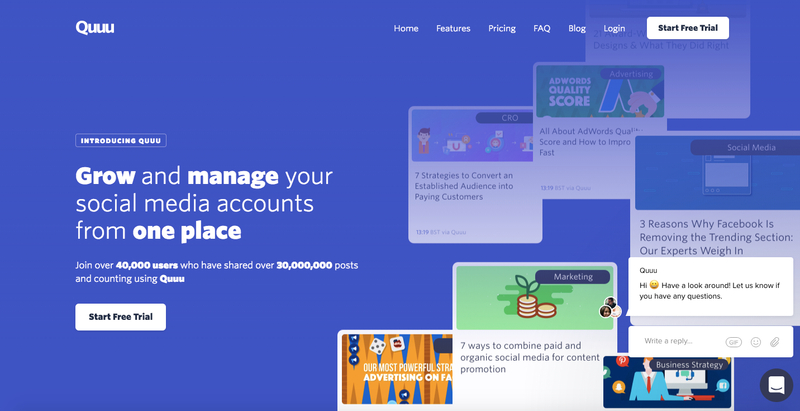 The social media channels that are supported on Quuu include Instagram, Facebook, LinkedIn, Twitter, and others, and the Quuu promote feature begins by selecting your URL, topic and then heading off to the dashboard to make it all happen. Among the many benefits of this software is the ability to receive curated content suggestions from 500+ interest categories. You can select up 6 suggestions daily and they can be added to your social scheduler. Not only does this social media management tool free up plenty of time that you can allocate to other activities, it also allows you to add multiple social profiles, with scheduling functionality and evergreen content tools. Quuu comes with a 14 day free trial, after your trial the pro-option starts at $15 per month while the small business option is $49 per month. 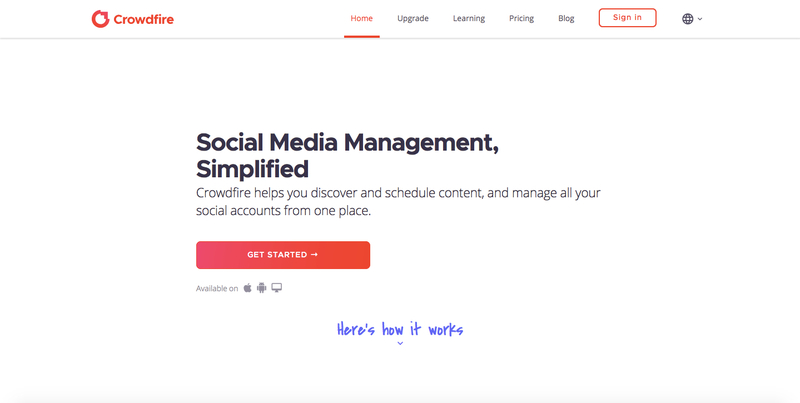 To close out our list of social media management tools to use, we have included Crowdfire. This social media management tool is a great scheduler and it allows you to manage multiple social accounts from one place. Take Twitter for a start – you can follow influencers, and instantly engage with your followers. Content relevance is a big deal with social media management, and Crowdfire curates content from across the web including images and articles. The plus plan is $5.99 per month and allows for 100 scheduled posts. The premium plan is $9.99 per month and also allows 100 scheduled posts with unlimited article cure ration and image correction. The VIP plan is $33.32 per month and allows for 800 scheduled posts per account with unlimited functionality and up to 25 RSS feeds. No matter what your business size there is a social media management tool to meet your needs. If you’re not sure which one is best for your business, don’t worry, they all come with free trials so you can take them for a test drive. Whichever one you pick, all social automation tools will help you grow your social presence and get more exposure, followers and customers for your business.